Guy Hoskie Dry Creek Turquoise Cluster Bracelet size 6 3/4"
This cuff is set with a group of eleven oval stones of natural, untreated Dry Creek turquoise arranged in a cluster design. 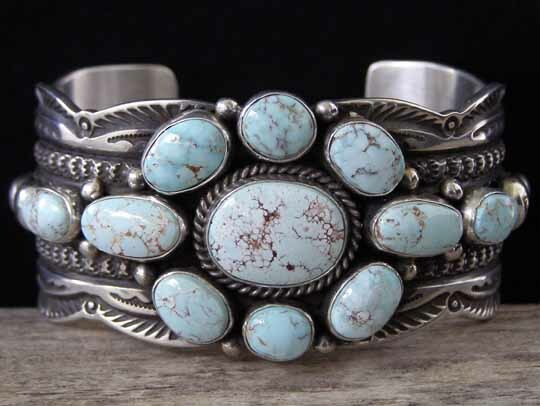 This pale blue Nevada turquoise is renowned for its fracture-resistant hardness. Currently the Dry Creek Mine is tangled up in litigation and, therefore, no turquoise is being mined there at this time. We still have access to a limitied amount of this turquoise. We gave this set of stones to Guy Hoskie and specified the size and width of the cuff; leaving him to determine how best to flatter the group of stones through his use of deep, biting stampwork and decorative elements such as appliquées and raindrops. Stones: center 11/16" x 1/2"; 2 ovals 9/16" x 5/16"; 4 ovals 7/16" x 5/16"; 2 ovals 3/8" x 1/4"; 2 ovals 3/8" x 5/16"
Width of cuff: 1 1/4"